WHERE TECHNOLOGY MEETS CRAFTSMANSHIP. The Model 597™ is easily the most advanced autoloading rimfire rifle ever built, and the first breakthrough in autoloading rimfire rifle technology in 35 years. The difference starts with our proprietary bolt-guidance system, which features a unique set of twin tool-steel guide rails for better stability, feeding reliability and greater out-of-the-box accuracy. Of course, we didn't stop there. The bolt, hammer and sear of the Model 597 all feature an exclusive Teflon®/nickel plating for smooth, dependable operation and an ultra-crisp trigger pull. To assure reliable, long-life accuracy, we've also incorporated a unique positive-locking, permanently rigid barrel attachment clamp. Receivers are grooved for standard rimfire mounts and tapped/drilled for Weaver-style bases. Completing the breakthrough design are an innovative last-shot "hold open" magazine feature and our patented, easy-to-use staggered-stack magazine. Model 597™ 22 LR Metal Magazine. Redesigned to provide flawless feeding of each round, the new Model 597 magazine offers unprecedented reliability. Constructed from a lightweight, magnesium-based alloy and cast as one piece via a non-conventional die-cast process, our metal magazine holds ultra-precise dimensional tolerances and yields an exceptional surface finish. Its extreme rigidity is ideal for demanding, high-volume use. For those who already own an older Model 597, you can own the improved magazine as a Remington® accessory. 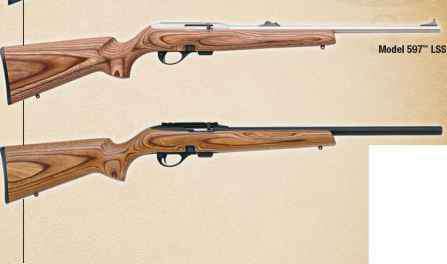 LOOKING FOR A CLASSIC RIMFIRE? CHOOSE YOUR MASTER. For those sportsmen who still love the look and feel of classic rimfire rifles, our Model 572™ BDL™ Fieldmaster and Model 552™ BDL Speedmaster® may be the finest available. And this year, you can drive tacks and drive home your support for the National Rifle Association® with the new NRA®-edition Speedmaster. It's laser-etched with NRA embellishments on both sides of the receiver, and a portion of the proceeds from each sale goes to the support the organization. 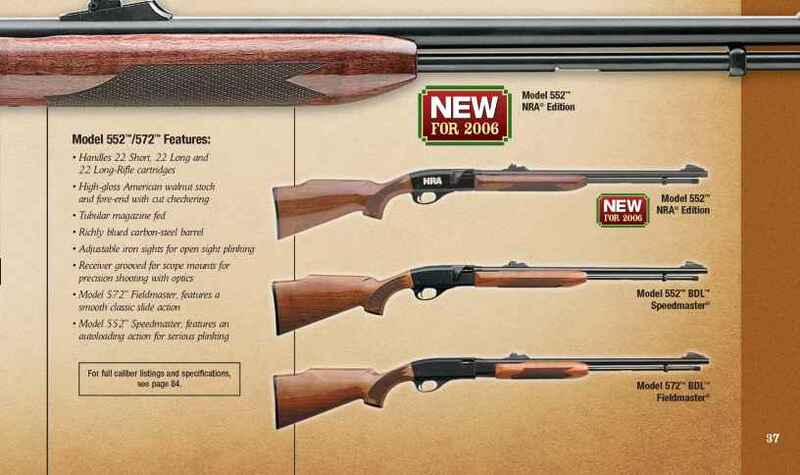 The versatile Model 572 BDL Fieldmaster is one of the most popular pump-action .22 rimfires made in America today. It handles .22 short, .22 long and .22 long rifle cartridges interchangeably. Other features include big-game sights, a positive cross-bolt safety and a grooved receiver for scope mounts. The lightning-quick Model 552 BDL Speedmaster is the only American-made .22 autoloader that handles .22 short, long and long rifle cartridges interchangeably. It's also equipped with iron sights, a positive cross-bolt safety and a receiver grooved for scope mounts. For full caliber listings and specifications, see page 84. THE NEXT GENERATION OF MUZZLELOADING EFFICIENCY. Magnum power, easy cleaning and legendary Remington® accuracy in a hot new design that defines reliable. Our innovative TorchCam™ action rotates from the fixed breech for fast priming and locks your 209 primer in a vault of weather resistance. It delivers rapid, super-hot ignition in the most extreme conditions. And to clean, simply unscrew the breech plug, swab the barrel and you're finished. We've stretched the limits of muzzleloader performance. With a full 28" of powder-burning steel, the Genesis generates maximum velocity from magnum 150-grain charges. And you get the swift-handling characteristics of a much shorter gun - the ultra-compact design of the TorchCam™ action keeps overall length and weight to a minimum. The barrel's 1-in-28" twist provides optimum stability for sabots and other modern muzzleloading projectiles. Our TorchCam™ action was designed with safety in mind. The over-travel hammer never comes in contact with the firing pin unless the gun is fully cocked and the trigger is pulled. A crossbolt safety adds extra assurance. 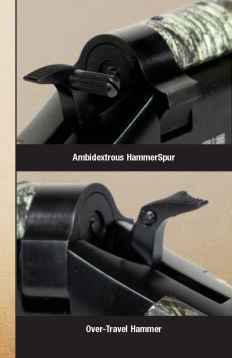 Our ambidextrous HammerSpur offers right- and left-handed shooters a rigid grip through cocking and hammer letdown without scope interference. 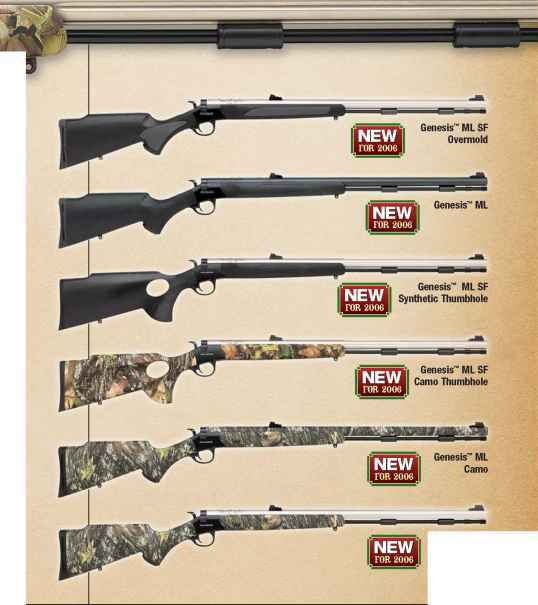 From the base model equipped with a standard synthetic stock and blued barrel to our super-stable thumbhole models with stainless, fluted barrels, this lineup includes a muzzleloader to suit the preferences and budget of every hunter. 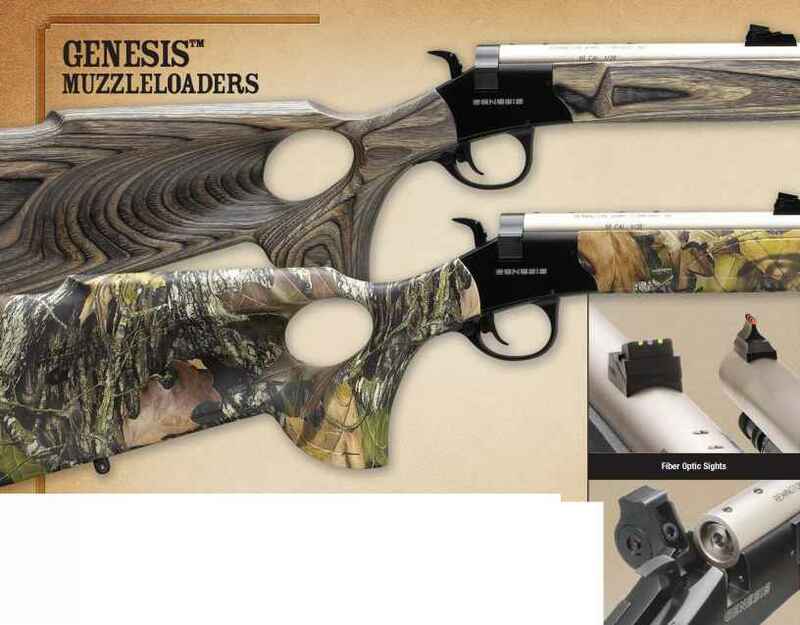 The Genesis Muzzleloader. Revolutionary camming action - built on our rock-solid foundation of accuracy and dependability.